With our belongings wrapped tightly in plastic bags and lashed to three body boards, the three of us tentatively wade into the creek. Soon the water is too deep to stand so we use the boards for buoyancy and kick for the other side. Ten minutes later, we’re standing on Whangapoua Beach, a long stretch of blindingly white sand backed by grass-covered dunes. Apart from a handful of birds, there’s not another soul here. It’s hard to believe we’re on New Zealand’s fourth-largest island in the middle of the busiest holiday of the year. 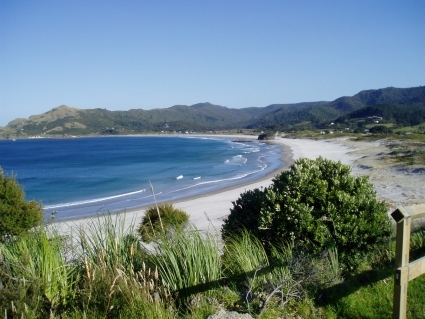 But that’s the appeal of Great Barrier Island – no one seems to know about it. The term “best-kept secret” is overused in travel articles but I honestly don’t understand why more people don’t come here. It’s only a four-hour ferry ride or 30-minute flight from Auckland and awaiting you is a ruggedly beautiful wilderness. This entry was posted in New Zealand by Rob McFarland. Bookmark the permalink.